Gifts from the Pirates: “Success is how high you bounce when you hit the bottom." “Success is how high you bounce when you hit the bottom." Last weekend Mrs M was mooching though our local items for sale Facebook page and spotted a trampoline for sale just around the corner from us, we debated getting one last year but thought that because of Seth's muscle condition it may not be the safest idea. We had a little chat and decided to give it a try, we had got rid of the boys climbing frame a month or so back so our garden was looking a little bare. The boys were really excited when it was up and their daily bouncing routine began (weather permitting of course). Having it in the garden has been a lot of fun, the boys love bouncing around but we have found that it has been used for something else too. It turns out that Opeie likes to use it as a sort of outdoor library, we pick a stack of books, fill the trampoline up, grab some pillows and lie down for a relaxing reading session which has been lovely because the weather has been so nice. Flavour of the month for Opeie is the Hairy Maclary books which he can't seem to get enough of, we brought them for Seth a couple of years ago because I loved Hairy Maclary from Donaldsons dairy when I was younger. Visitors to the house don't get away without reading in the netted library first either and yesterday Mrs M's parents were Opeie's reading guests. It was lovely sitting in the garden listening to them both read to Opeie, I think it's really important for all the family to get involved with things like reading with the boys. It's a great starter for Opeie's learning and development and will leave him with lasting memories of just how loved he is. As nanny Roo so nicely put it 'these are precious moments'. 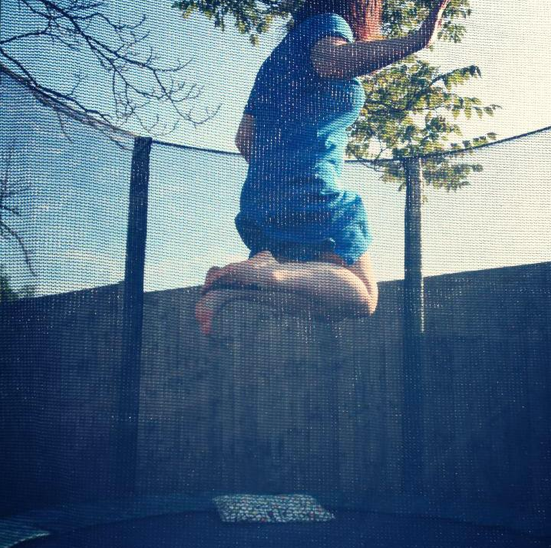 Once the books were away Mrs M used the trampoline for what she needed... Drying her hair apparently!! !